According to a recent report from Fox News, a man driving his pickup truck on Interstate 80 and was towing a large BBQ trailer when he crashed. 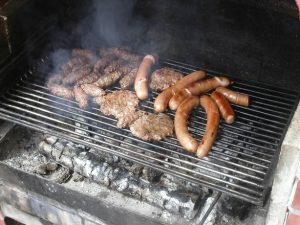 Authorities alleged that the barbeque trailer managed to become disconnected from the black pickup truck and resulted in a major car accident involving four other vehicles. Witnesses have said that when the trailer became unhooked, a woman driving a car directly behind it attempted to swerve out of the way to avoid slamming into the trailer. Unfortunately, the three motorcycle riders that were directly following her vehicle did not have time to react and they all crashed into barbeque trailer at a high rate of speed, as this was a major interstate. Two of the motorcycle riders were in serious condition when first responders arrived on the scene of this major car accident. Paramedics did what they could to stabilize the two seriously injured riders and transported them to a local level-one trauma center for continuing treatment. One of these riders was severely injured and was listed as being in critical care following the accident with life-threatening injuries. The other rider suffered a severe injury to his leg. The third motorcycle rider was also injured in the crash, but his injuries are not believed to be as severe as the two others. Both the woman driving the car who witnessed the entire accident and the driver of the black pickup truck stayed on the scene and cooperated with police. The police were still conducting their investigation into the cause of the crash hours after the accident, as the highway was still closed. It is important to note that the driver of the pickup truck has not been charged with a crime or formally accused of negligence immediately following the accident. As our Boston personal injury lawyers can explain, car accidents and cases of severe personal injury are sometimes the result of faulty equipment on a vehicle or cargo that was loaded in a negligent manner. For example, there are numerous cases each year where a tire comes off one of the rear wheels of a semi tractor-trailer and seriously injures or even kills someone who is on the road or the sidewalk. We have seen cases where one of these tires comes flying through the front windshield of a car and kills the driver. In some of these cases, the driver of the truck may not even realize the tire came off. The reason for this is because the rear tires in sets of two on each side called dualies. The truck’s ride may not be significantly affected by the loss of a rear outer dualy on an 18-wheeler. However, it is still the truck driver’s responsibility to make sure all of the tires are in working and safe condition before each trip. In fact, the United States Department of Transportation (DOT) requires that each driver of a commercial vehicle perform a full pre-trip inspection of his or her vehicle, and this includes walking around the vehicle and checking all tires. Failure to do so could be negligence.